Simon Pegg does a fabulous job as Hector, a psychiatrist who isn’t happy and isn’t making his patients happy. So he heads out into the world to search for happiness. And he finds it, for a moment. Then like most of us, he finds that it isn’t real, or it’s going to leave us, or we thought it would make us happy but doesn’t. 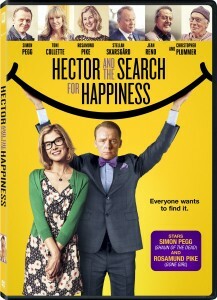 Hector suffers on his journey as he searches for happiness. Have tissues ready, this one made me cry as well as laugh.